Kirk remembers that their mission says something about seeking out new life, so he agrees to give Sargon the benefit of the doubt. Spock’s already initiating some “first contact” of his own—Sargon tells him, “Your probes have touched me, Mister Spock.” But the science officer’s instruments only detect energy deep below the surface of the planet (where else would it be? ), where their transporters can’t reach. Not to worry, Sargon has it all under control. He even sets their transporters for them with the coordinates of a chamber with a breathable atmosphere. Kirk asks Dr. McCoy to join him, but Spock-blocks his second-in-command who is looking forward to studying their new friend. After all, what if something happens to both of them? All the power goes out and Kirk gets the message: Sargon wants the Vulcan along. The power comes back on and Spock accompanies Kirk to the transporter room, where they find a grumpy McCoy and a beautiful astrobiologist, Dr. Ann Mulhall, who answered a mysterious summons of her own and reported there without Kirk’s orders. Kirk doesn’t even know who she is, but what’s there to complain about? Sargon beams down the away team, sans their two red shirts. Oddly, the security guards are fine; they were just left behind on Enterprise, the luckiest break of their probably short lives. The others end up in a vault that was created half a million years ago, when the planet’s atmosphere was ripped away. Its walls are made of a strange alloy Spock has never seen before. One of these fancy walls opens and they discover an inner chamber with a large glowing sphere inside: Sargon, or what’s left of him. SARGON: Sealed in this receptacle is the essence of my mind. SPOCK: Pure energy. Matter without form. MCCOY: But you once had a body of some type? SARGON: A body much as yours, my children, although our minds were infinitely greater. McCoy points a phaser at him and orders him out of Kirk’s body, but Spock comments that this is useless while Sargon is in control. Meanwhile, Sargon revels in the flood of new sensation in a living body instead of his receptacle—phenomenal cosmic power, itty-bitty living space. SARGON (In Kirk’s body): Lungs filled with air again. To see again. Heart pumping, arteries surging with blood again. A half a million years. To be again. Your captain has an excellent body, Dr. McCoy. I compliment you both on the condition in which you maintained it. Unfortunately, Sargon’s presence pushes Kirk’s body to dangerous limits: his blood pressure is increasing and he’s running a 104-degree fever. 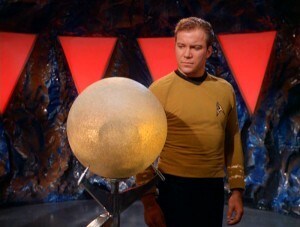 Meanwhile, the sphere glows feebly with the essence of Kirk’s mind, which is too weak to allow him to speak to them. When Sargon and I exchanged, as we passed each other, for an instant we were one. I know him now. I know what he is and what he wants, and I don’t fear him. McCoy and Mulhall think he’s nuts, but Sargon allows them to return to Enterprise to discuss the situation, with the understanding that if a single person doesn’t want to cooperate, they will be free to go. They used to say if man could fly, he’d have wings. But he did fly. He discovered he had to. Do you wish that the first Apollo mission hadn’t reached the moon, or that we hadn’t gone on to Mars and then to the nearest star? That’s like saying you wish that you still operated with scalpels and sewed your patients up with catgut like your great-great-great-great-grandfather used to. I’m in command. I could order this. But I’m not because Doctor McCoy is right in pointing out the enormous danger potential in any contact with life and intelligence as fantastically advanced as this. But I must point out that the possibilities, the potential for knowledge and advancement is equally great. Risk… Risk is our business. That’s what the starship is all about. That’s why we’re aboard her. They beam the three receptacles aboard and perform the transfer in Sickbay. As soon as Henoch is in Spock’s body, he begins flirting with Nurse Chapel, while Sargon (in Kirk’s body) and Thalassa (in Mulhall’s) go at each other. They kiss, but things heat up too quickly and they collapse, their bodies unable to handle the burden of the alien minds inhabiting them. Henoch is having no trouble with his borrowed Vulcan physiology, so it’s up to him to work up a “metabolic reduction” formula to make it possible for Sargon and Thalassa to function in their human hosts. It turns out Henoch isn’t entirely on the level. He likes Spock’s body and doesn’t want to give it up for a mechanical one, so he prepares a different formula for Sargon, so he will die in Kirk’s body. When Chapel notices his deception, he makes her forget it and forces her to believe the hyposprays are correctly loaded. As Sargon weakens but shrugs it off, certain that he was given the correct formula, Henoch tries to tempt Thalassa into keeping her own body. She doesn’t relish the thought of being in a robot body that can’t feel anymore than he does. In turn, she tries to convince Sargon. THALASSA: In time, a host body will become accustomed to us, husband. Injections will no longer be necessary. SARGON: That will take months, perhaps years. We haven’t that choice, Thalassa. THALASSA: Husband. Feel the touch of my hand, husband. THALASSA: Beloved. What will that word mean to a machine? SARGON: Our thoughts will intertwine. THALASSA: Will they, husband? Will they intertwine like this? Can two minds press close like this? Can robot lips do this? They kiss, and once again it’s too much. Sargon collapses and McCoy pronounces him dead. Now all that remains of Kirk is his mind, trapped in the receptacle in Sickbay, though they can keep his body functioning for a time. Henoch completes Thalassa’s android body, but she’s horrified when she sees it. 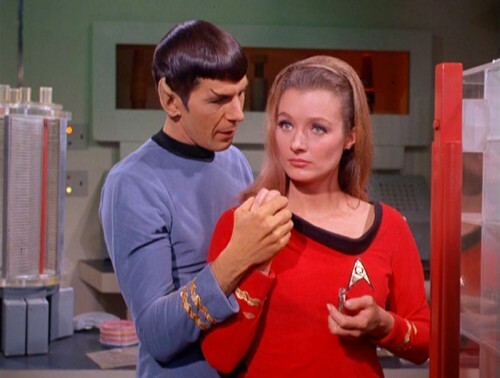 His taunts drive her to propose a bargain with Dr. McCoy: she will restore Captain Kirk’s mind to his body if he will allow her to keep Mulhall’s body. All he has to do is pretend that she switched back and none will be the wiser. MCCOY: Neither Jim nor I can trade a body we don’t own. It happens to belong to a young woman. THALASSA: Who you hardly know. Almost a stranger to you. MCCOY: I will not peddle flesh. I’m a physician. THALASSA: A physician? In contrast to what we are, you are a prancing, savage medicine man. You dare defy one you should be on your knees worshipping? I could destroy you with a single thought. And she tries to do just that, surrounding McCoy with flames and causing him great pain. She relents, realizing that Sargon was right to limit the use of their power. Sargon congratulates her for not succumbing to the temptation. It seems he didn’t die after all, he simply transferred his consciousness into Enterprise’s computer systems. McCoy goes to his office, leaving Thalassa and Sargon to discuss their plans. Bones, prepare a hypo. The fastest, deadliest poison to Vulcans. Spock’s consciousness is gone. We must kill his body, the thing in it. On the Bridge, Henoch is torturing Uhura and terrorizing the crew, while Chapel stands blankly by his side. Kirk, Mulhall, and McCoy arrive to stop him, but he inflicts pain on the captain and Mulhall. McCoy tries to inject him with the poison, but Henoch instructs Chapel to take the hypo from him and inject the doctor instead. She seems to comply, but turns it on Henoch at the last moment. Sargon prevents him from transferring to a new body and he collapses to the deck. Kirk laments the loss of his friend, but Sargon comforts him: “I could not allow your sacrifice of one so close to you.” The lights flicker and he switches Spock’s consciousness from Chapel’s body back into his own. It was all a trick! Chapel’s and Spock’s minds shared her body for a while, so Henoch wouldn’t discover him. Sargon made McCoy think he had filled the hypo with poison so Henoch would read his mind and believe it, when it was merely a sedative meant to convince him to flee and destroy himself. However, Sargon has come to a sobering conclusion after Henoch’s actions. “We now know we cannot permit ourselves to exist in your world, my children. Thalassa and I must now also depart into oblivion,” he says. He asks only for one small favor: to borrow Kirk’s and Mulhall’s bodies for one last time. The captain and doctor agree, allowing the aliens to share a touching moment, and a final kiss before departing. THALASSA: Oblivion together does not frighten me, beloved. Promise we’ll be together. “Return to Tomorrow” is a breath of fresh air after a stretch of crappy and mediocre episodes. I remembered this as one of several bodyswap/alien possession episodes of the series, but was truly stunned with how compelling and moving it is. It’s easy to mock Shatner’s melodramatic turn as Sargon (“Heart pumping, arteries surging with blood again.”) but he couples this same moment with a more nuanced performance, walking jerkily as though unaccustomed to legs after eons without a body, which neither the talented Leonard Nimoy or Diana Muldaur replicate when they act possessed in turn. Nimoy, of course, clearly enjoyed the opportunity to stretch his acting—and facial—muscles, playing out of character and allowing Hen-Spoch (did you see what I did there?) to smirk, smile, and scheme his way through his scenes. This episode is remarkable because it isn’t about our usual Star Trek characters or their actions. It’s really focused on the relationships between Sargon, Henoch, and Thalassa, what happened to their civilization, and their efforts to regain some of their lost glory. Although Kirk and the others do give them the means to play out their power struggle and attain closure, they are pretty much stripped of any agency or ability to affect the outcome. Sargon, at least, is trying to make up for their mistakes by guiding the humans to a better end; it’s no surprise that he takes Kirk’s body, because they’re driven by the same passion and idealism for the future, and they share some of the same arrogance about their abilities and potential. He’s also just as good as the captain at tricking his enemies. I only have one glaring nitpick on this one: why didn’t Sargon build android bodies instead of receptacles and a giant underground chamber, if they had the knowledge and materials? Perhaps they didn’t have enough time, or it wouldn’t have done them any good without a way off the planet? Speaking of which, is a planet Class M if you can’t breathe on it anymore? Why is Mulhall in a red uniform if she’s a scientist? And what’s with everyone addressing Mr. Scott as “Engineer” all the time? Finally, it’s interesting that Spock seems to agree with Sargon’s suggestion that they are related, claiming it would “explain certain elements of Vulcan prehistory.” Henoch discovers that the Vulcan body is more compatible with his mind, the receptacles are reminiscent of Vulcan katric arks, and we know Vulcans are capable of transferring their minds into other bodies as well. All in all, a fantastic episode. Torie Atkinson: The first thing I did when I was able to finally peel my eyes away from this breathtaking episode was look up whether the writer had contributed anything else to Star Trek. When I learned he didn’t, I became heartbroken. “Return to Tomorrow” is what science fiction (and Star Trek in particular) is all about: the pursuit of science and new experiences, the beauty of connecting to one another in a mostly empty universe, and the feeling of limitless possibilities. Bodyswapping is one of my least favorite SFnal tropes, but “Return to Tomorrow” pulled it off with finesse. It’s a love story—not just between Sargon and Thalassa, but a paean to the richness of the human consciousness. But this isn’t just a cold examination of the importance of scientific progress—it’s a tribute to love and the intangible human experience. Humans are fundamentally lonely, trapped inside their own minds and bodies (or spheres…), but when they connect—when they find a piece of themselves in someone else—something beautiful and luminous happens. I liked that when Kirk gets his body back, he says he’s not afraid anymore, because he felt and understood Sargon. The real achievement here is that despite the fact most of the episode involves our main characters acting as puppets, I never for a moment felt like I was watching anyone other than Sargon, Thalassa, and Henoch. There was nothing cheesy about it, and those personalities, so different (and yet so not…) from our heroes, were commanding, compassionate, and all their own. I ached for Sargon and Thalassa when they spoke of not wanting to be forgotten, begging Kirk to “rescue us from oblivion,” and yet in the end they chose oblivion as a final act of compassion. Most painful, of course, was watching the two of them in their new bodies come to terms with the ultimate inadequacy of machines to communicate love. I still think the androids would have been fine until they came up with a better solution 1000 years down the line, but their decision to disappear together was touching and, well, romantic. I also want to note something I found insanely impressive in this episode: plot coherence. It was smart and never used plot coupons to shortcut to something. Sargon gives Kirk time to think about his proposal because “After all these centuries, we can wait a few more hours.” Thalassa suggest enlisting actual engineers to help build the android. And most importantly, the final reveal was actually clever. I can’t tell you how impressed I was about the resolution. Major props here to Nurse Chapel, who manages to be strong, funny, and sweet all at once. We don’t see her character nearly often enough, but every time she’s around she just shines. It still kills me that Barrett could have been Number One—she’s a scene-stealer and such a rich and fabulous actress. My one unresolved question though: what do you all think the “cataclysm” was? It seemed like an environmental disaster of some kind (an environmentalism metaphor? ), since the atmosphere was ripped away, as opposed to, say, a war. Syndication Edits: None, it seems. Trivia: In the original script, Sargon and Thalassa continue on as spirits, but Roddenberry rewrote the ending, prompting writer John T. Dugan to use his pen name John Kingsbridge. In a deleted scene, Sargon’s planet is referred to as “Arret” (Terra backwards). The name “Sargon” apparently comes from Assyrian and Mesopotamian kings, “Henoch” appears in the Old Testament, and “Thalassa” is the name of a Greek sea goddess. This episode marked George Takei’s return to the show after his 10-episode absence to film The Green Berets. Diana Muldaur (Mulhall) was so good, she returned to Star Trek not once, but twice: as Dr. Miranda Jones in the third season “Is There in Truth No Beauty?” and of course as Dr. Katherine Pulaski in season two of Star Trek: The Next Generation, where she still has little affection for androids. Kirk refers to the Apollo moon landing, which wouldn’t happen until the following year with Apollo 11. Next Episode: Season 2, Episode 21 – “Patterns of Force.” US residents can watch it for free at the CBS website. Unfotunately, the ending as discussed here is apparently the ending used in the “remastered version” and contains a huge disappointment for those of us who actually saw the original series when it WAS the original series,upon its first air dates. The funny moment between Spock, Chapel, and other main cast members has been totally eliminated. Without it, the ending given falls quite flat. This is not the only such major goof up, flub, or mess made in doing the “remastered version”…several other key plot moments were eliminated in various episodes, one so badly edited out that the scene clearly leaps from one position to another without continuity. Additionally, the CGI used in “remastering” –hard to call it that as it is neither a redo or a restoration but a completely alien add in that so changes the look of everything going on outside the ship that requires a moving shot that it is utterly jarring to people familiar with the real series– essentially destroys the realistic feel imparted by the use of film shots with model technology. Far from substandard or “only” the best at the time, that method gave a nicely realistic feel to the motion patterns utterly lacking in all CGI work involving space/air/water craft in ANY cinematiceffort to date. It IS the current fad, and it probably looks Coooooooooooolll to those who have no reality check on how such things move, but to those of us who do, CGI fakery destroys the illusion of reality that served this series (and good filmwork) so well. We only review the unremastered, original versions of these episodes, so I haven’t seen the remastered version you’re talking about. Did they delete the whole poison bait-and-switch at the end? This episode didn’t have any syndication edits so I’m wondering if this was a DVD issue. My guess is that Dj Brumby has only seen the broadcast version of the remastered episode, which is edited for time, just as the non-remastered versions were in syndication. On the DVDs and blurays the episodes are full length. I actually enjoy having both versions available. Although my heart will always lie with the original versions, it’s interesting to see the new effects shots too. The blurays are the best way to go in this case, since they offer the option of watching the episodes with the new effects or the original ( and also FINALLY include the original mono soundtracks in addition to the re-jiggered remixes ). @2 Torie – Brumby is referring to the little tableau at the end, after Sargon and Thalassa leave. Kirk makes a gently whimsical remark about the aliens appreciating their “cooperation,” Dr. Mulhall says “I was happy to cooperate, Captain,” and Christine makes a little sound and when everyone looks at her, she’s crying just a bit, and says “It was beautiful.” That’s the last line in the original episode. I’ve seen one syndication where almost all of it was edited out and only Chapel’s “It was beautiful” was left. > Where’s the connection to transubstantiation? essence) becomes something else while retaining its outward form (accident). also are imbued with another reality. identity, soul if you will, inner reality of any given thing. what that means to you…. That’s a rather fascinating analysis. Is there any way to, uh, substantiate that this might have been a conscious effort by John Kingsbridge? My one minor gripe watching this episode is, when it’s revealed the receptacles are destroyed and it’s believed that Spock’s conciousness is gone, Kirk’s reaction seems matter of fact. Even when Henoch flees and they bellieve Spock’s body dead, Shatner really underplays the grief that Kirk would feel. I wish he had shown more emotion, at least a flicker of remorse over his face in sickbay. It just seems a very restrained reaction considering the depth of their friendship. compare his reaction here to his concern in “A Private Little War” or even “Spock’s Brain” ( and of course the naked grief shown “Star Trek II – The Wrath Of Khan ). After all, it’s not as though Shatner is renowned for his subtlety ( most of the time ). * In reality, IIRC Bones shagged as many alien babes as Kirk did in the entire series run.